Usain Bolt has recently won the gold medal in the 200m of Beijing Athletics World Championships, with a time of 19.55″, that is the 10th best ever time. 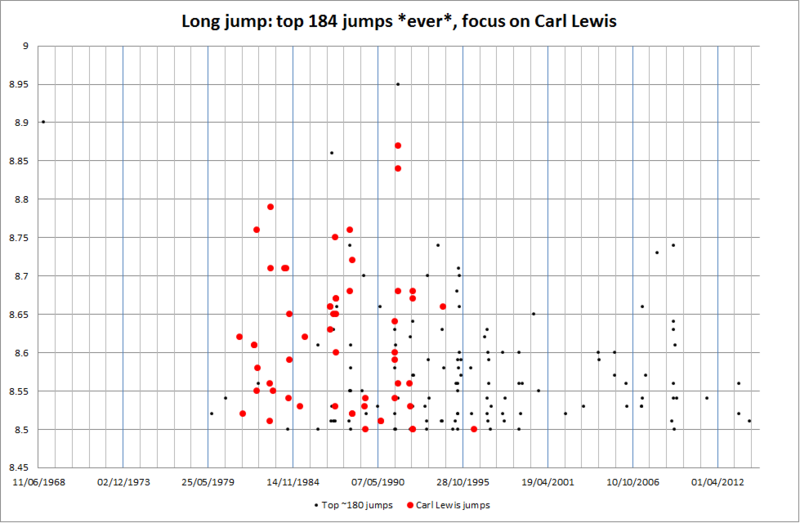 Best ever ~180 long jumps, focus on Carl Lewis. 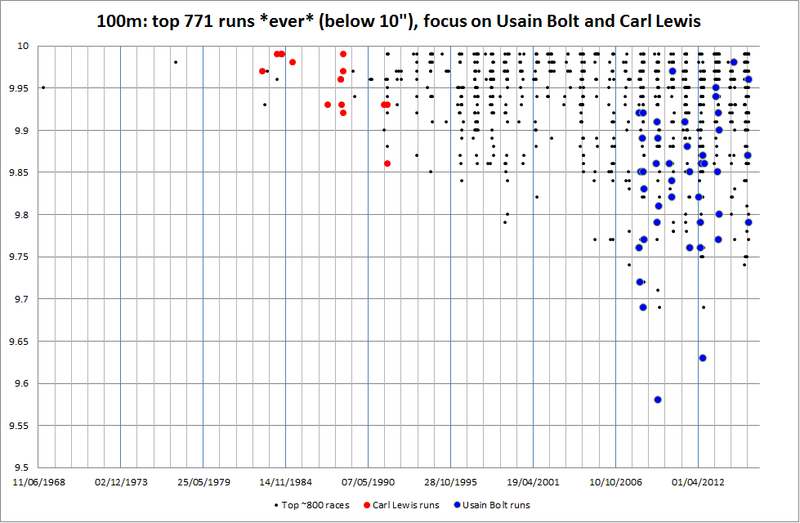 Best ever ~800 100m times, focus on Carl Lewis and Usain Bolt. Now, in 2015, 18 years later, of the best 184 long jumps ever (all those at or above 8.50m), 55 of those jumps (a 30%) correspond to Carl Lewis. I let you to qualify the feat. The runs (100m and 200m) Carl Lewis did in the 80s would probably not win him any gold medal today; his jumps would still win him almost everygold medal today. just 1 to Carl Lewis. 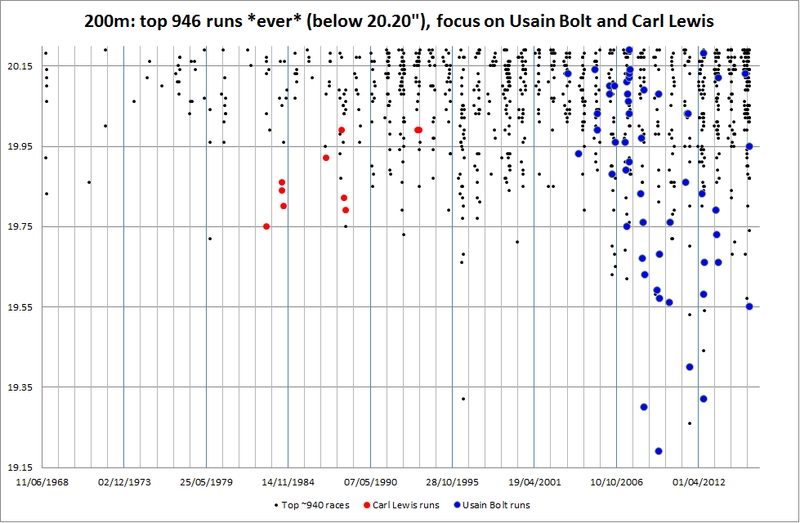 In this post, I want to compare Usain Bolt and Carl Lewis as 200m sprinters. I will use as a source again the website with all time best performances in track and field (maintained by Peter Larsson). Best ever ~950 200m times, focus on Carl Lewis and Usain Bolt. In the previous graph you can notice that times in the 200m have significantly improved since the 80s and 90s. Usain Bolt is today way faster than Carl Lewis was in the 80s. just 7 to Carl Lewis (4%). Compare that 14% of best times of Usain Bolt in the 200m with the 17% in the 100m. Despite his telling that the 200m is his preferred distance, his dominance of the 100m has been even greater. Anyway, compare that to the 30% of long jumps today (while he retired 18 years ago) of best long jumps of Carl Lewis. … and it seems that Lewis was first a jumper, then a 200m sprinter (despite of never holding the world record of any of those) and then a 100m sprinter. Whereas it seems that Bolt is a more distinguished 100m sprinter despite of what he likes best. I think Lewis had the long jump WR for a while (minutes) during the astonishing final in Tokyo against Powel. In the video I included in the notes to the first post of the series (here) it appears that jump (8.91m) but it was wind-aided and therefore didn’t qualify for a world record.